Happy Father’s Day to all the dad, granddads and other father like figures out there. Hope you all have a great day. President Barack Obama graces the cover of today’s edition of Parade Magazine with his daughters Malia and Sasha. President Obama talks about how much fatherhood is important to him when it comes to his two daughters and how many fathers need to step up to the plate and spend more time in their childrens lives. Two days before the inauguration, PARADE published a letter from Barack Obama to his daughters about what he hoped for them and all the children of America. The letter attracted international attention. On this Father’s Day, we asked the President to reflect on what fatherhood means to him. As the father of two young girls who have shown such poise, humor, and patience in the unconventional life into which they have been thrust, I mark this Father’s Day—our first in the White House—with a deep sense of gratitude. One of the greatest benefits of being President is that I now live right above the office. I see my girls off to school nearly every morning and have dinner with them nearly every night. It is a welcome change after so many years out on the campaign trail and commuting between Chicago and Capitol Hill. But I observe this Father’s Day not just as a father grateful to be present in my daughters’ lives but also as a son who grew up without a father in my own life. My father left my family when I was 2 years old, and I knew him mainly from the letters he wrote and the stories my family told. And while I was lucky to have two wonderful grandparents who poured everything they had into helping my mother raise my sister and me, I still felt the weight of his absence throughout my childhood. As an adult, working as a community organizer and later as a legislator, I would often walk through the streets of Chicago’s South Side and see boys marked by that same absence—boys without supervision or direction or anyone to help them as they struggled to grow into men. I identified with their frustration and disengagement—with their sense of having been let down. In many ways, I came to understand the importance of fatherhood through its absence—both in my life and in the lives of others. I came to understand that the hole a man leaves when he abandons his responsibility to his children is one that no government can fill. We can do everything possible to provide good jobs and good schools and safe streets for our kids, but it will never be enough to fully make up the difference. That is why we need fathers to step up, to realize that their job does not end at conception; that what makes you a man is not the ability to have a child but the courage to raise one. 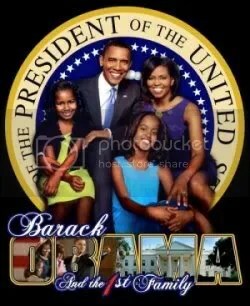 Read the entire article at Parade Magazine.com and check out the Obama family photo album. Good morning and Happy Father’s Day to all the dads, granddads and other father like folks out there. Hope you all have a great day. Father’s Day doesn’t receive all the hype and hoopla that Mother’s Day receives but fatherhood is still important in our society. According to the History Channel the first known celebration of Father’s Day occurred on July 5, 1908. The first known celebration of Father’s Day was on July 5, 1908 in Fairmont, West Virginia, where it was commemorated at William Memorial Methodist Episcopal Church South – now known as Central United Methodist Church. Grace Golden Clayton is believed to have suggested it to her pastor after a deadly explosion in nearby Monongah in December, killing 361 men. It was also during a sermon in 1909 that Sonora Smart Dodd became inspired by Mother’s Day. After the death of her mother, Sonora and her siblings were raised by their father William Jackson Smart, a Civil War veteran. Sonora wanted to show how thankful she was to her father and, because William was born in June, she worked to have the first Father’s Day celebrated on June 19, 1910. In 1924, President Coolidge recommended that Father’s Day become a national holiday. President Johnson designated the third Sunday of June to be Father’s Day in 1966. It was not until 1972 that President Nixon instituted Father’s Day as a national observance. Did You Know – Roses are the official flower on Father’s Day, red for fathers who were still living and white for those who have passed on. Check out History.com for more information about Father’s Day. On Friday President Barack Obama held a national day of conversation about fatherhood and personal responsibility. Famous and not so famous fathers mentored youth throughout Washington, D.C. area on Friday at the request of President Obama. The students of Ballou Senior High School’s automotive technology program can thank Barack Obama’s absent father for their current predicament: getting rapped at by Darryl McDaniels of Run-DMC, who’s mixing rhyme and reason about being a good man and finding significance in one’s life. He and a dozen male students are sitting in the program’s auto shop in Southeast yesterday afternoon, sheltered from the first truly sunny day in recent memory. The students consider this theory. Former Pittsburgh Steelers coach Bill Cowher sits nearby, silently, in a beige suit and blue oxford shirt, next to the diagram of a multi-part fuel-injection trainer. His mustache won’t say whether he’s smiling. The Super Bowl champion and one-third of the legendary hip-hop group were in the garage as part of President Obama’s national day of conversation about fatherhood and personal responsibility. Father’s Day is tomorrow, and Obama — whose father’s absence shaped his life and inspired a best-selling book — deployed famous and semi-famous men to eight sites in the Washington area to interact with nonprofit organizations that focus on youth mentorship. Obama visited one such group in Arlington yesterday morning before heading back to the White House for a town-hall meeting on fatherhood and a mentoring session with young men on the South Lawn. You can read the entire Washington Post article here.